What is Quality Content? We Answer the Question of the Ages! 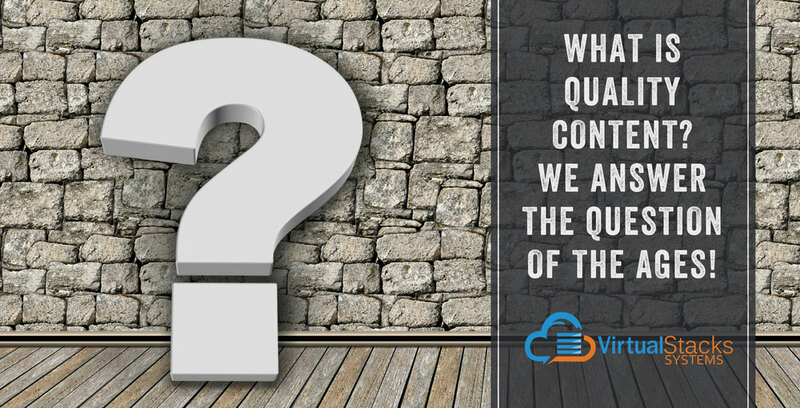 08 Jun What is Quality Content? We Answer the Question of the Ages! “Content is King” is the inescapable mantra of content marketers. A seemingly endless number of blog posts extoll the importance of providing “quality content,” but very few define it. As if the product of spontaneous generation – the archaic belief that living organisms arose from inanimate materials – quality content is expected to just appear and magically boost SEO rankings and move the needle for the client’s business. Today, this example of quality content is here to explain itself and the process. And understand that “content” includes video and graphics – not only the written word. First, quality content is original. Google favors original content, and will penalize sites containing articles appropriated from the posts of other websites. Google’s major 2011 Panda algorithm update effectively drove “content farm” e-zines off its top rankings (and out of existence). Many of these sites “spun” articles by paraphrasing the original and replacing large parts of the copy with synonyms, and tried to rank for keywords the original didn’t. However, there’s a caveat: Even original content can be awful. Search Engine Land’s informative history of bad content provides the back story and context for Google’s wrath. Examples of such – including instructions for bathing a small rodent and “How to Play The Xylophone”– are unintentional works of comedy. Which brings this quality blog post to the next point: quality content is well-informed. The writer already has a strong command of the subject, or possesses strong research skills – preferably both. The writer knows how to find credible, authoritative online sources for the appropriate industry, such as websites for trade groups, professional accreditation groups, etc., and can write knowledgeably about the subject based upon such research. Closely related, quality content is accurate. Information is attributable to legitimate sources; statistics can be verified and linked to their source. Accuracy helps establish your organization as being reliable, trustworthy and committed to quality in every other area of business. Accuracy also includes fact-checking, as well as using correct grammar, spelling and punctuation – which necessitates careful, consistent proofreading. Quality content is informative and actionable. It is written to the wants and needs of the target audience, giving people answers to questions and/or useful information they can immediately or quickly incorporate into their life. Our blog post for client Adams and Son Plumbing – “It’s 4 ‘O Clog! Here Are the Top 4 Causes of Clogged Toilets” – provides practical advice on how to avoid this particularly expensive (and unhygienic) plumbing emergency. A major SEO benefit, of course, is that others will link to your content because it has information worth sharing. Quality content connects with its audience. This goes beyond merely providing information to making a connection based upon understanding and empathy – the sense that the author of the post “gets it” regarding the audience member’s experience with or feelings about the subject matter. A good deal of establishing this connection is writing in the right “tone of voice” for the topic. For example, our blog post for client Daniel’s Lawn Service – “Spring Flowers You Want In Your Central Florida Garden” – is written in an engaging, personable style to appeal to gardening enthusiasts. The invitation to step into a colorful backyard paradise to enjoy a neighborly cup of coffee is irresistible! In contrast, our blog post for client DocuServe – “Blockchain 101: What You Need to Know About Blockchain” – covers a very technical topic. The post features insightful perspective from Blockchain pioneer Ian Kane, giving it extra appeal and credence to DocuServe’s target market of businesses in need of document security solutions. • Make pages primarily for users, not for search engines. • Don’t deceive your users. Our quality blog post now concludes with the self-promotion you’ve been anticipating. Virtual Stacks Systems provides full-service digital marketing – including social media services – for a one-stop solution that can meet your company’s goals. We invite you to tell us what you want to achieve, and look forward to providing needle-moving quality content for you. If you happen to sell xylophones, we definitely will write a much better blog post than the one referenced in the third paragraph.